Vyapar means business and Vriddhi means increase. 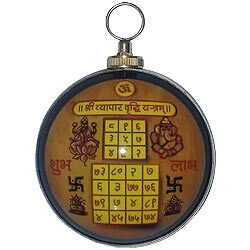 As the name signifies, this Yantra increases sales, turnover and profits in business or profession, and blesses the owner or holder of this Yantra with success, progress and prosperity in work & career. It blesses the worshipper with achievement of objectives, accomplishment of targets, and overall success in ventures. Increase in business and profits are guaranteed.